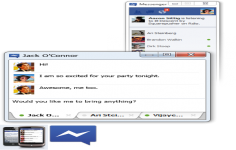 Facebook Messenger allows to chat with friend, colleagues or anyone in the list without using any Web browser. Facebook is the most used social network in the world. However, to connect, it is undeniable to use a browser. 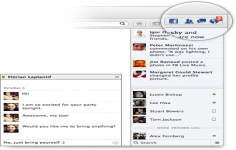 Using tools such as Facebook Messenger, it is possible to access the account without using a browser. This software allows the user to follow the news on Facebook via the software interface. He can see his contacts statuses and comments. It can also write on the wall of a friend or on his own wall. Using Facebook Messenger, the user will be able to receive notifications of its business and as well as contacts and in real time. As usual, he can see the notifications, comment, "liker", etc. Incorporating features for its online version features, this email client can fit wherever the user desires or be justified to the right of the screen image of the web version. Double-click on the contact line can interact in a more minimalist interface as therein only his username to focus solely on the discussion. Facebook Messenger can play sounds to be notified in real time of new connections and conversation. Curently we don't have any log information about Facebook Messenger version 2019. We will this change log update soon!